Collagen is what gives volume, flexibility and strength to healthy, young skin. As part of the aging process, your own natural collagen breaks down, diminishing facial volume and elasticity. This loss of elasticity and volume results in wrinkles, facial lines and skin laxity – all of which rob your skin of its youthful, fresh appear¬ance. Dermal Fillers are used to add volume for a more natural appearance as well as reducing or eliminating wrinkles. Treatments can be done in 30-45 minutes. Most dermal filler results last 6-8 months, but some products are shown to last longer. Though similar, each dermal filler product has its ideal application. Knowing what works best, and where the product is needed, is often the key to creating the best possible results. Because of our expert training, Mirabile M.D. MedCosmetic in Kansas City has successfully used these filler products for many years leading to an in-depth knowledge of their capabilities and limitations. Our loyalty is with the patient, not the manufacturer. We will always recommend the best treatment for your specific needs. Dermal fillers are often used in combination with wrinkle relaxer injectables such as Dysport or Botox. This combination of treatment techniques is also known as a ‘liquid face lift’. Juvéderm® – Juvéderm is ideal for moderate to severe wrinkles around the nose and mouth, providing a smooth and supple appearance. Learn more and see before and after photos. Juvéderm Voluma®XC – Voluma instantly adds volume to your cheek area to correct age-related volume loss. It can provide you with contour and a subtle lift for up to two years. Learn more and see before and after photos. Juvéderm Vollure™ XC – is specifically tailored with a balance of gel firmness and low cohesivity, yielding a versatile formulation that adds subtle volume for the correction of moderate to severe facial wrinkles and folds. Results can last up to 18 months. Radiesse® – Radiesse treats moderate to severe wrinkles around the cheek, mouth and chin. Plus, Radiesse is the first dermal filler approved for use in hands! Learn more and see before and after photos. Restylane® Lyft, – previously known as Perlane®, treats moderate to severe wrinkles around cheek, mouth and chin. Learn more and see before and after photos. Restylane® Silk – designed specifically to treat the lip and mouth area. Lip thinning lost shape and vertical lip lines are ideal conditions for Restylane Silk. Learn more and see before and after photos. Restylane® Refyne – designed with XpresHAn Technology™ to help soften laugh lines (nasolabial folds and marionette lines). This can help you restore a more natural look to your face while maintaining your facial expressions. Restylane® Defyne – helps smooth out deep laugh lines (nasolabial folds and marionette lines). Using innovative cross-linking technology, Restylane Defyne is a hyaluronic acid dermal filler that is able to help restore a more youthful, natural-looking appearance, while helping you maintain your natural expressions. Allergan, the makers of Juvederm, and Galderma, the makers of Restylane and Sculptra; each offer patient rewards programs providing you discounts on future cosmetic injectable treatments. 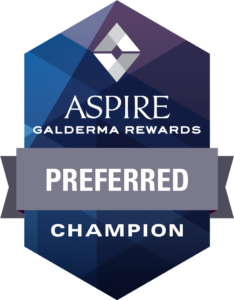 Asprire Galderma Rewards rewards you with points to redeem toward instant savings on Galderma treatments and products including Dysport, Restylane, Restylane Silk and Sculptra Aesthetic. Learn more and join today. Aspire offers additional points when you refer a friend to the program. Plus, if you receive a treatment of Dysport at least four times in two years at our clinic in Overland Park KS, you’ll earn bonus points. After 1 syringe of Restylane Silk. Actual Mirabile M.D. MedCosmetic patient.